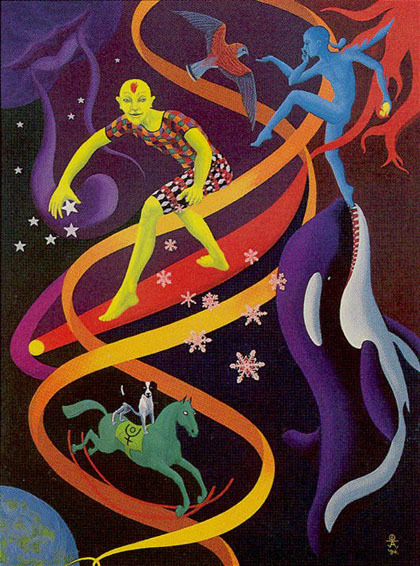 The Navigators Tarot of the Mystic Sea is descended from the Golden Dawn decks developed in the early part of this century - Aleister Crowley's Thoth and that of the New Order of the Golden Dawn are the two best-known decks of this type. The Tree of Life appears to be the theme of this deck. An unusual characteristic, it reverses the order of the Major Arcana cards, starting with the World and working backward to the Fool. This deck is probably best suited to someone who has studied Kabbalah and some numerology as well. Anyone who is familiar with Rachel Pollack's work, 78 Degrees of Wisdom and/or The Kabala of Numbers by Sepbarial, will find this deck rewarding to work with. The Major Arcana retain their traditional titles, with the following exceptions: Universe = World, Aeon = Judgment, Art =Temperance, Suspension =The Hanged Man, Destiny = Justice, Fortune = The Wheel of Fortune, Arch Priestess = The High Priestess, Magian = Magician.